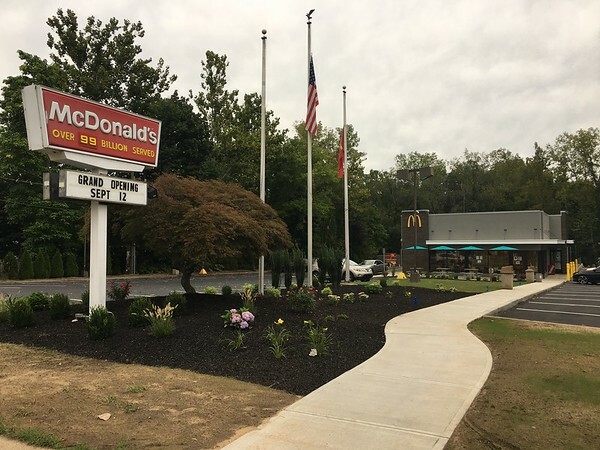 BERLIN - Following weeks of renovations, McDonald’s in Berlin will have a ribbon cutting on Wednesday, Sept. 12, with a Coffee with a Cop event beforehand and McFamily FunNight in the afternoon. The ribbon cutting will take place between 10 and 11 a.m., with Coffee with a Cop happening between 9 and 10 a.m. McFamily FunNight will take place between 5 and 6 p.m., featuring face painting and balloon animals. Veterans will be on hand to raise the flags, and the Berlin Little League and Berlin Food Pantry, for holiday collections, will receive donations. McDonald’s is at 185 New Britain Road. The renovations are part of an effort by McDonald’s called “Experience of the Future,” said Elaina Haskos, who handles marketing for the Haskos Organization, which owns the Berlin location and four others in the area. The other locations are two in Cromwell, and one each in Cheshire and East Hampton. The $700,000 worth of renovations includes kiosk ordering, table service, a second order point outside and renovations to the lobby, front center, exterior and outdoor menu boards, said Elaina and John Haskos. John Haskos owns and operates the Haskos Organization. “It’s been a family business,” John Haskos said, and he would like to continue that legacy. He started the organization in 2012 with his father and his grandfather, who were already in the business, making him the third generation, John Haskos said. “The owners really just want to get involved,” said Elaina Haskos. The McDonald’s will host “Teacher Nights,” in which teachers and administrators, mainly from Sacred Heart School, will get behind the counter and take orders. “We have partnered with McDonald’s and the Haskos Organization to host our first ever Coffee with a Cop event,” said Deputy Police Chief Chris Ciuci in a press release for the cop event. As part of the grand reopening, McDonald’s will be offering specials all week, including 69-cent hamburgers and 79-cent cheeseburgers on Monday; 99-cent two piece buttermilk crispy tenders on Tuesday; free small McCafé coffees from 9 to 11 a.m. on Wednesday in-store only; $1.99 Big Mac sandwiches on Thursday; 2 for $4 Filet-O-Fishes on Friday; 99-cent hotcakes all day; and 79-cent sundaes on Sunday. Posted in New Britain Herald, Berlin on Sunday, 9 September 2018 21:12. Updated: Sunday, 9 September 2018 21:14.